Living outside the US has given me a wider perspective of how others view the Land of the Free and the Home of the Brave. The USA seems to be in a bit of funk lately. As a nation we are uncertain who we are and what we stand for. Perhaps America is experiencing a mid-life crisis? Still the seeds are there, planted by our great-grandcestors. My Quaker ancestors were part of England’s first non-violent mass civil disobedience against the crown. The Lord Mayor of London tossed them in jail. 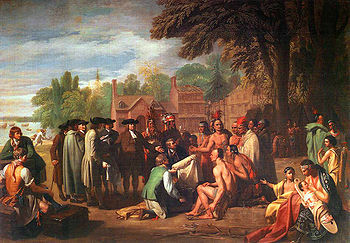 Instead of waiting for the English government to change, in 1682 my Quaker family accompanied William Penn on The Welcome and settled in Pennsylvania. Penn crafted the Framework of Government for his “Holy Experiment” thus creating a government reflecting the future “American” ideals of religious tolerance, open discourse, fair taxation, private property, free enterprise and trial by jury. But the Quakers were not the first people there. And after William Penn’s death, his descendants claimed land rights that forced the indigenous Leni Lenapes (aka the Delawares) to move further west. Between the “Walking Purchase” and the Moravian Christian missionaries, the Delawares began to view the Christian Europeans with mistrust. It was my great-grandfather Zebulon Heston II and his nephew John Lacey III, who traveled west and brought the Quaker Christian vision to Leni Lenape Chief named White Eyes. Sharing their updated vision of the Holy Experiment, Chief White Eyes believed them and offered a Token of Friendship wampum belt with a message for the Quakers. Chief White Eyes became pro-American. But as a believer in Peace, he kept the Delaware tribes neutral for three years. However, in 1778 he was finally persuaded, probably because of his friendship with then Brigadier General John Lacey, to become a Colonel in American army, and he rallied the Delawares to the Americans’ side. My grandfather Zebulon Heston II did not witness his nephew or the Delawares taking up arms. His death was recorded in the Buck County Minutes on July 2, 1776 two days before the Continental Congress issued the Declaration of Independence. As it seems we are once again in Dark Times, it is up to us, those that are little thought of at this time, the moderates, the people of conscious, and those that believe in Love and Unity, to gather and nourish the Peaceful seeds our grandfathers planted. And to believe in the vision of what America can be.